On March 27, 1868, whaling ships at Kawaihae on the west coast of Hawaiʻi observed dense clouds of smoke rising from Mauna Loa’s crater, Mokuʻāweoweo, to a height of several miles and reflecting the bright light from the lava pit. Slight shocks were felt at Kona on the west coast and Kaʻū on the flanks of the volcano. On the 28th, lava broke out on the southwest flank and created a 15-mile flow to the sea. Over 300 strong shocks were felt at Kaʻū and 50 to 60 were felt at Kona. At Kilauea, the surface of the ground quivered for days with frequent vigorous shocks that caused lamps, crockery and chairs to spin around as if animated. One shock resembled that of a cannon projectile striking the ground under the proprietor’s bed, causing him to flee, according to the narrative published by C. H. Hitchcock in the Bulletin of the Seismological Society of America in 1912. Between March 28, 1868 and April 11, over 2,000 distinct shocks were felt at Kona. The main shocks struck on April 2, at 4:00 p.m., and again on April 4 at 12:30 a.m., the epicenter was located near Waiohinu. The shock was felt throughout the islands, as far as Niʻihau about 350 miles away. The ground rolled like a ship at sea and many walls tumbled down. A landslide three miles long and thirty feet thick swept down the hill carrying trees, animals, and men. Thirty-one people and thousands of cattle, sheep, horses and goats were killed in the one slide. A tsunami struck the coast from Hilo to South Cape, being most destructive at Keauhou, Puna and Honuʻapo; 180 houses were washed away and 62 lives were lost to the wave alone. A 10-foot-high wave carried wreckage inland 800-feet. Not a house survived at Honuʻapo. A stone church and other buildings were destroyed at Punaluʻu. Maximum wave heights were 65 feet, the highest observed on Hawaiʻi to date. At Keauhou (now Keauhou Landing) the water rose 35-50-feet destroying all the houses and warehouses and drowning 46 people. At Hilo, the height of the wave was about 10-feet, and at Kealakekua, 6-feet. The tsunami also was observed on Maui and Oʻahu. Also felt on Lānaʻi, Maui, Oʻahu, and Kauaʻi. This major earthquake caused 77 deaths (tsunami, 46; landslide, 31). At Kaʻū, the more substantial houses and every stone wall were thrown down. At Waiʻōhinu, a large stone church collapsed within 10 seconds of the onset of shaking. The shock “ruined” the few stone buildings in Hilo and shook down almost every wall. Brooks became muddy. At Kealakekua, strong trees were bent backward and forward “like reeds in a storm.” Ground waves as much as 2-feet from ground to crest were observed at Kohala. Extensive surface effects were observed in the epicentral region. Ground fissures extended from Pahala to Kilauea. At Kahuku, a fissure about 5 kilometers long was reported. A volcanic eruption took place from that fissure a few days later, on April 7. Along the Puna coast, the land subsided in places as much as 6-feet. At Kaimū, trees stood about 8-feet deep in sand and water. The plain at Kalapana sank about 6-feet, and water stood as much as 5-feet deep over 20 acres of formerly dry land. Much of the information here is from USGS, with some noted from the diary and letters of Mrs. Sarah J. Lyman, wife of missionary David Layman in Hilo. 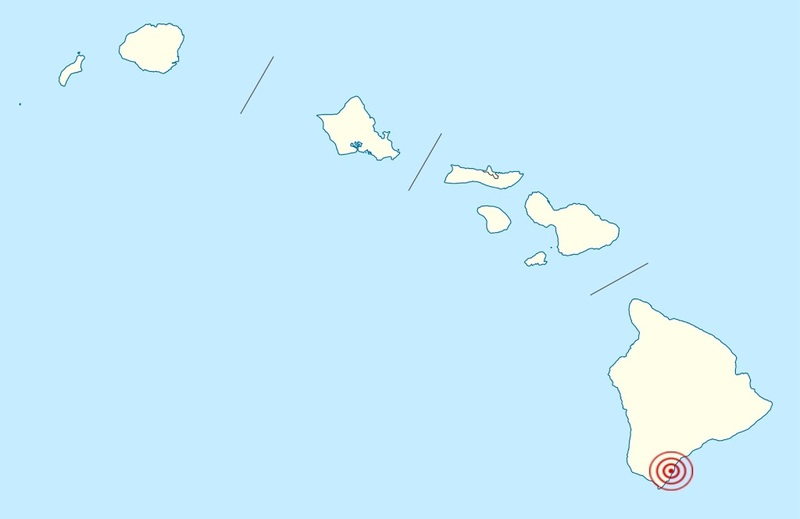 The image shows the map of the islands and the general location of Hawaiʻi’s largest earthquake.